Would you hire Thomas E. Brady? What if Drew Bledsoe had never gotten hurt? Beyond that, what if the New England Patriots had never spent a sixth-round flyer on a little-known quarterback out of the University of Michigan in the 2000 NFL Draft? If you were an employer in Ann Arbor, Michigan looking for an entry level worker, you might have seen the resume of one Thomas E. Brady, Jr. float across your desk. 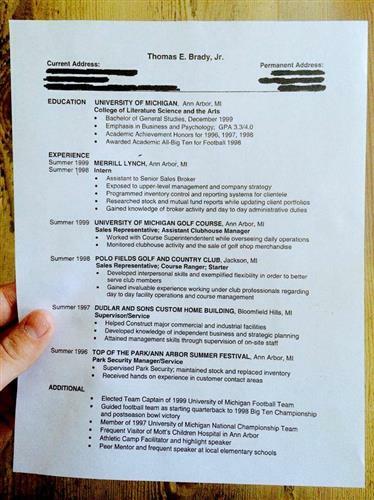 Brady uploaded his old resume to Facebook Thursday morning. 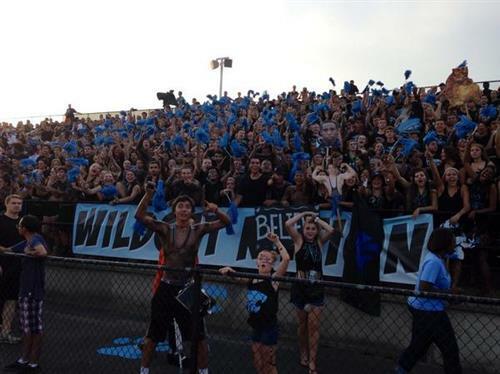 His work experience included such college student standards as security for a festival, basic construction, and golf course pro shop manager. So, would you have hired Tom Brady? WASHINGTON -- This is quite a production. Actor Bryan Cranston, of “Breaking Bad” fame, teamed up with the MLB Fan Cave to produce a six-minute mockumentary of a fake one-man show about the Major League Baseball postseason. Cranston goes through the full range of emotions, making call-backs to postseason legends like Carlton Fisk and Kirk Gibson, and even famous cartoon Baseball Bugs, featuring Bugs Bunny. “Any actor who tells you that he is not inspired by Bugs Bunny is a liar, frankly,” says Cranston in the piece. File this under things we probably wish were real. But hey, we’ll settle for the bit. WASHINGTON -- According to FOX 26 Houston, Minnesota Vikings running back Adrian Peterson has been indicted for reckless or negligent injury to a child in Montgomery County, Texas. According to Fox 26's Mark Berman, Peterson’s attorney Rusty Hardin, the same lawyer who represented former Major League pitcher Roger Clemens in his perjury trail, confirmed there was an indictment. Peterson owns a home in the Houston suburb The Woodlands, within Montgomery County lines. "The Vikings are in the process of gathering information regarding the legal situation involving Adrian Peterson. At this time, we will defer further questions to Adrian's attorney Rusty Hardin." 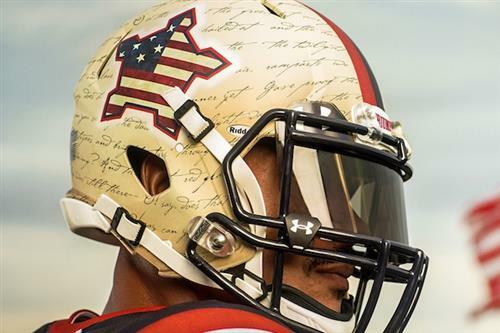 The University of Maryland -- via their apparel provider, Under Armour -- is again pushing the boundaries of style with this weekend’s uniforms, meant to honor the 200th anniversary of the writing of the poem that inspired The Star-Spangled Banner. Let’s start with the helmets, which appear gold at first glance, but are really designed to look like parchment paper with the words to the song scribbled along them in quill ink. 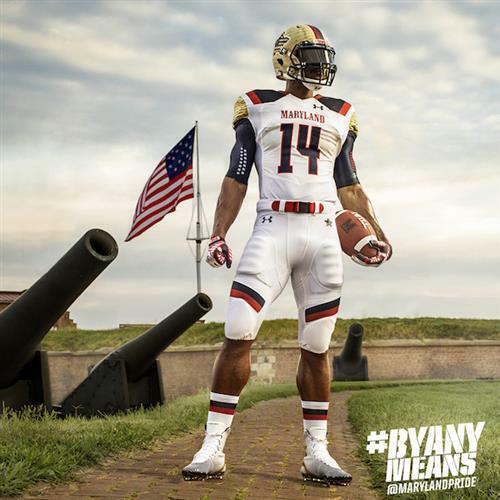 Rather than a logo, the outline of Fort McHenry is emblazoned over that on the side of the helmet, with the American flag embedded. The jerseys and pants are white with red and blue piping, and an additional strip of paper/words on the sides of the shoulder pads. Meanwhile, Maryland also announced this morning they have extended their contract with Under Armour for another 10 years. Yay. WASHINGTON -- Baseball and football may be in the spotlight right now, but the FIBA World Championships in Spain are introducing the world to international basketball and some of the traditions each county brings with them. To that end, the New Zealand team’s pregame Haka dance prior to their game against the United States left a stunned Derrick Rose and James Harden wondering just what in the world was happening. It may have worked at first, as the Kiwis trailed by just seven points after one quarter. But the Americans pulled away from there in a 98-71 victory. Former Major League pitcher John Rocker will appear with his girlfriend on the 29th (!!!) season of “Survivor,” according to Entertainment Weekly. Rocker, who was best known for his racially charged ranting about New York City, was last seen selling raffle tickets in Cooperstown for the chance to go on a night of drinking with him. No word yet on whether Rocker will train for the rigors of the great outdoors by riding the 7 train back and forth from end to end. The biggest question here, though, is how have there been 29 seasons of “Survivor” and how old are we, seriously? 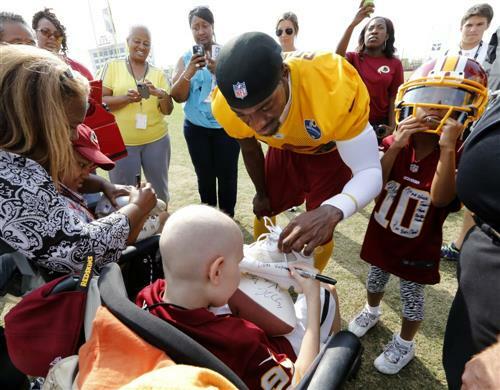 WASHINGTON -- In a column by Mike Wise of The Washington Post Wednesday, former NFL referee Mike Carey revealed that he asked specifically not to be assigned to any Redskins games from 2007 on, due to his aversion to the team name. 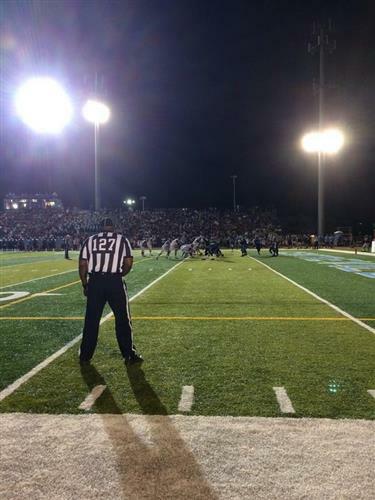 The 19-year veteran, who was the first African-American referee to work a Super Bowl and was widely regarded as one of the best in the game, now works in the NFL main office a rules analyst. 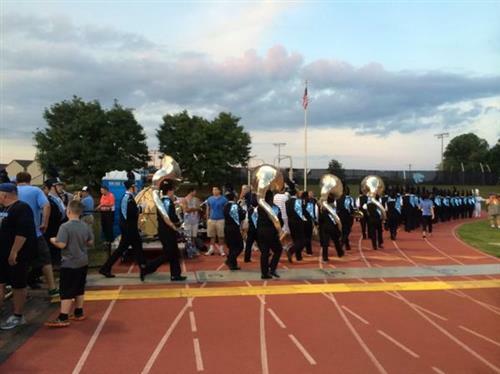 His views only came to light thanks to the larger discussion among whether or not the name will be used on broadcasts this season. For the complete story, visit The Washington Post. If you played Little League growing up, you probably had some good coaches and some bad coaches. But you probably never had one give a speech as good as David Belisle, skipper for Rhode Island’s Cumberland American squad. Following his team’s elimination from the Little League World Series Monday night, Belisle gathered his young men and gave them advice they will probably carry with them for quite some time. This is on the level of Gene Hackman in “Hoosiers,” or Al Pacino in “Any Given Sunday.” Thanks, coach, we’d play for you any day. WASHINGTON -- In case you missed it, Sunday evening’s Nationals-Pirates game was bananas. After playing five rather uneventful, scoreless innings, the Pirates turned a host of weakly hit groundballs into a two-run rally in the sixth, as Washington forgot the basic tenets of how to throw and catch baseballs. Evidently, poor defense is contagious, as Pittsburgh gifted runs right back to them in similar manner in the seventh. My avatar does not endorse the last two innings of this game. Good grief. The Nationals built a 4-2 lead, which they took to the ninth, where Pittsburgh blew up Washington closer Rafael Soriano for three runs to push ahead, 5-4. That’s where we first meet our young protagonist. After rescuing the game from the depths, the Pirates made a mess of the bottom of the ninth, narrowly escaping with a tie game into extra innings. But Scott Hairston’s sacrifice fly in the bottom of the 11th eventually sent Washington home as walk-off winners for the second straight night. Join us as we watch this young fan ride the rollercoaster of baseball emotions into the sweet night. Washington -- In the least surprising sports news of the week, a brawl broke out at the joint practice between the Oakland Raiders and Dallas Cowboys in Oxnard, California on Tuesday. Perhaps more surprising, the NFL doesn’t seem to have any issue promoting the altercation, posting video to its official Twitter feed. That escalated quickly. A fan Instagram video shows us more of the aftermath, though it’s unclear whether this is part of the same incident, or a separate one. Other than Raiders running back Maurice Jones-Drew fighting out from the bottom of a pile of Cowboys sans helmet, it’s hard to say exactly what happened here based on the video. Less difficult to determine was why the altercation briefly entered the stands, thanks to (presumably) a Raider fan’s use of a team helmet (Drew’s?) to hit Cowboys cornerback B.W. Webb in his own helmet. The two teams practice together again on Wednesday. Looking for the authentic DMV food experience, all shoved together inside the friendly confines of a hot dog bun? 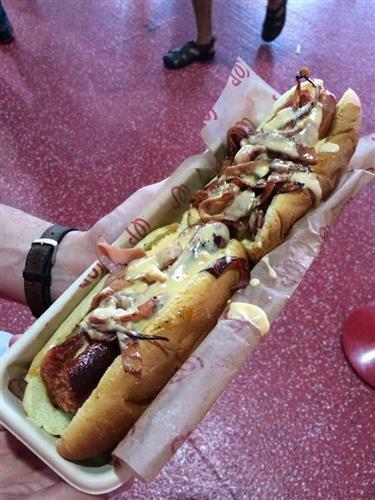 Presenting the DMV dog at Nats Park: a treat for the culinary masochist deep inside your gut. The concoction starts with a footlong half smoke, a food staple of the District, often associated with Ben’s Chili Bowl. From there, it is “smothered with Maryland crab cheese,” taking it in a similar direction to Baltimore’s heralded Crab Mac and Cheese dog. But then it jumps off the deep end. As a coup de gras (yes, the strike of grease), the offering is topped with Virginia ham, because why not. Behold, the elusive beast, for all to see. Warning: just looking at it may make your heart hurt.